Tiny but quite sophisticated, the Matsushiro Toyota Land Cruiser even featured a little driver who would “steer” the car as you drove around. Sold by Gama in Europe, this was a realistic and featured-packed little R/C toy that would have made for a really fun first R/C car. Whether you were the lucky kid on your block with the Tamiya or Kyosho vehicle. Or you had something much smaller and basic. 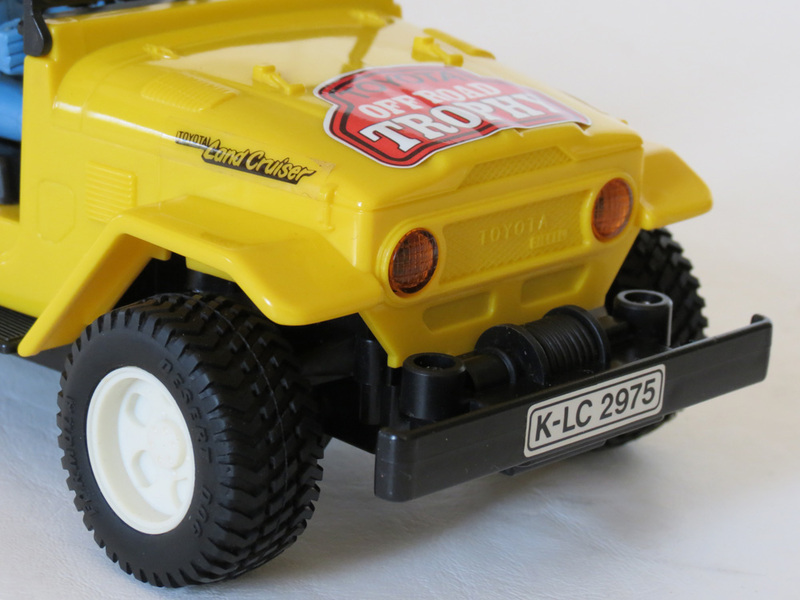 The very first R/C car you ever had (particularly if you grew up in the 1980s) probably left you with some fond childhood memories. After all, prior to 1979, there were no R/C toys in the shops at all. Well, there were – but they were mostly gas-powered and only really accessible to adult hobbyists (or kids whose parents owned them). 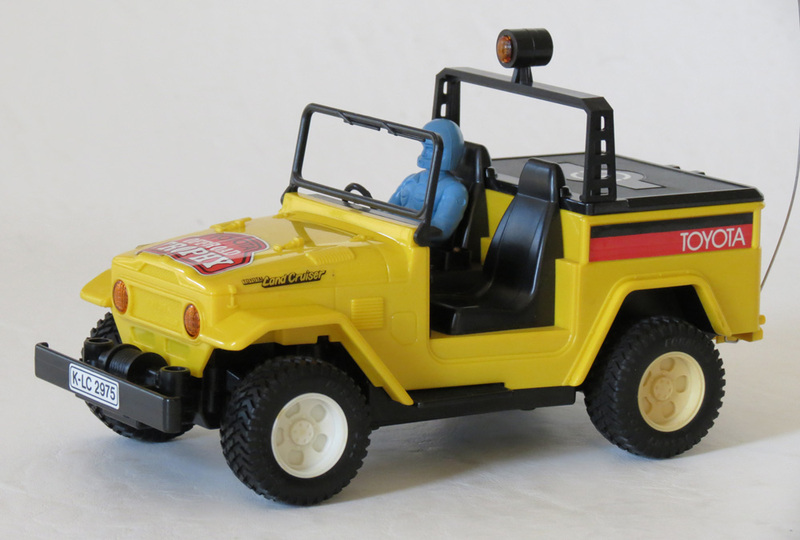 Electric R/C toys were relatively uncommon back in those days, and it wasn’t until the early 1980s that they became mainstream. Which meant that any little kid who got one around that time was getting something that was both fun – and quite new on the market. And even the packaging usually went to extra lengths in explaining each toy’s features and functions – something you rarely see today. 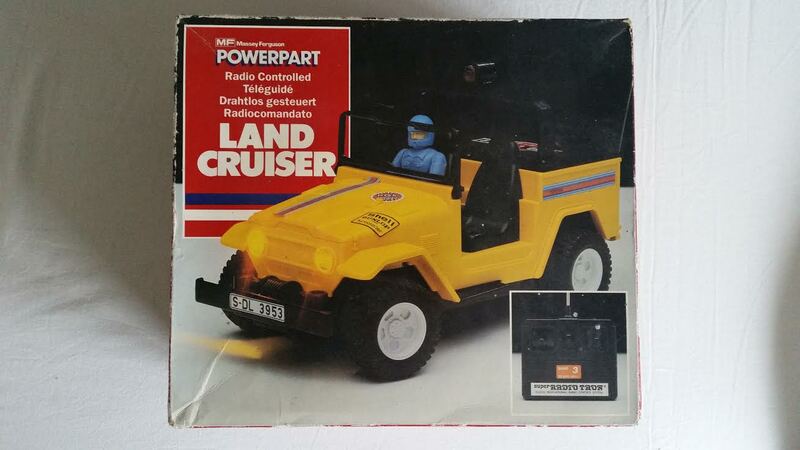 My first R/C toy was a Tandy Jeep Renegade. Which was pretty sophisticated and fairly large, and one of the top-of-the-line toys at Tandy in 1984. But my very first “remotely controlled” toy of any kind was something simpler that I receive a year or two earlier – a “sonic-controlled” Lancia Stratos (also from Tandy). I still have both of these, in their boxes. And they’d be two of the first things I’d grab if the house was on fire. It’s funny how we associate so many memories with inanimate plastic objects. But when seen through the eyes of a child, toys like these were a lot more than than mere plastic cars with four wheels. To my eyes, they promised endless miniature adventures along the trails and tracks of my home. 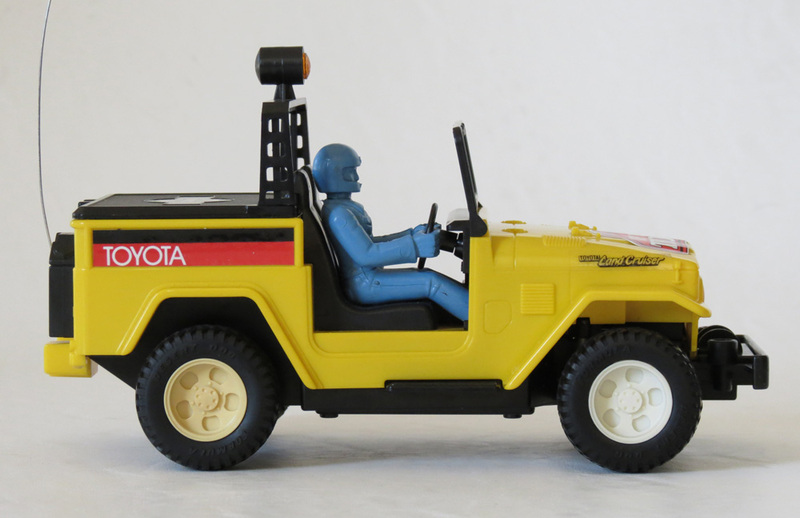 While many of the smaller, more basic R/C toys of the early 1980s were exactly that – basic (my sonic-controlled Lancia could not even turn left and right! ), there were some small R/C models elsewhere in the world which were designed to be both affordable and relatively sophisticated for their size. 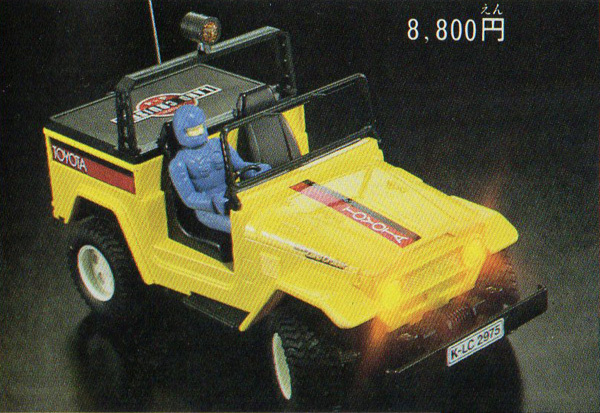 One of the more interesting R/C brands to come out of Japan in the 1980s was Matsushiro. I’ve already written about their very popular 4WD model “The Winch“, which was a cute ’40 series’ Toyota Land Cruiser. 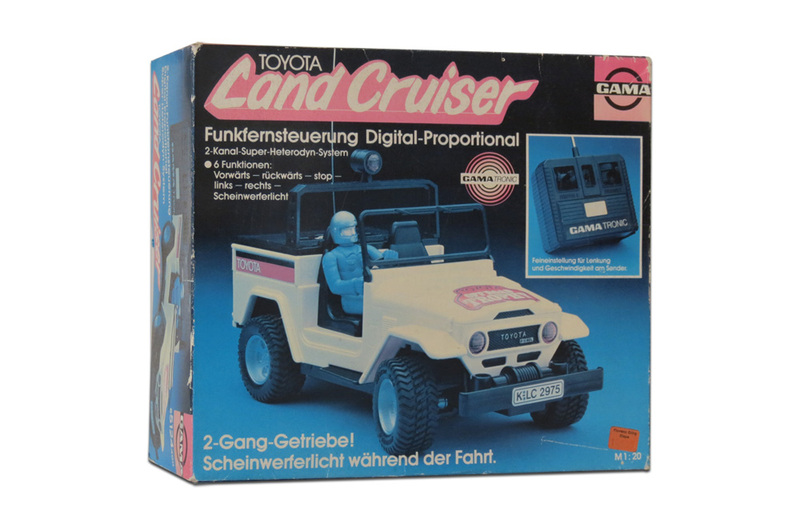 And here’s another – even smaller – Land Cruiser toy from the same company. This time simply called – “Toyota Land Cruiser”. As a huge fan of early Toyota Land Cruisers (and a former owner of one), all these Land Cruiser toys really take me back to the 80s, when the majority of four wheel drive vehicles on the market were truly intended for off-road use. They also made great inspiration for toy makers, as they began to explore the idea of R/C vehicles that could travel on dirt, not just pavement. 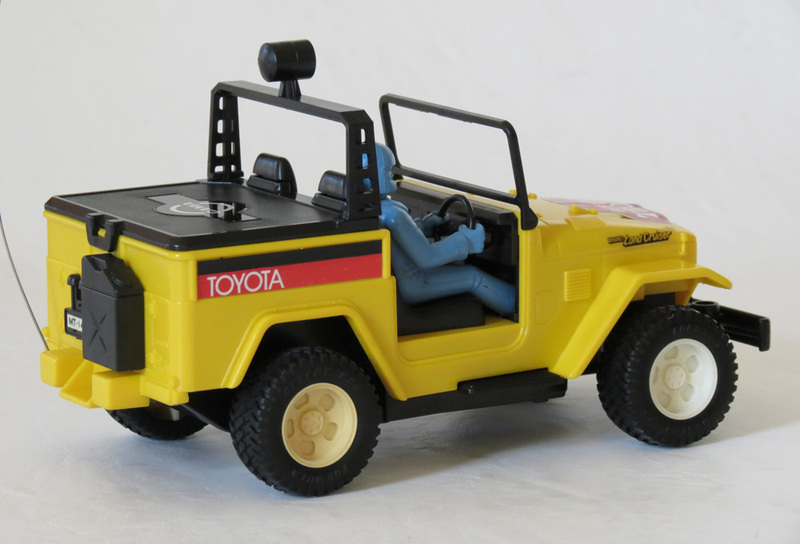 The Matsushiro Toyota Land Cruiser is a 1/20th scale R/C car that dates from about 1984. Matsushiro was a toy company based in Tokyo that appears to have existed in the 1970s and until the mid-1980s, and most of their toys feature the name “K.K. Matsushiro” on their underside. This stood for Kabushiki Kaisha Matsushiro. Like many Japanese companies, Matsushiro appears to have been named after it’s founder, who was possibly named Yukimitsu Matsushiro. If nothing else, I do know Yukimitsu Matsushiro was the inventor of many of the R/C models that the company released, all of which were ready-to-run toy grade models. And while lesser-known, they were every bit as good as the nicest cars from Nikko during their golden era of realistic R/C models in the early 1980s. The example featured on this page is how this car was released in Europe, where it was distributed and co-branded by the Gama company (thus I’ve called this the “Gama/Matsushiro Toyota Land Cruiser” release). In addition to the branding, it seems a couple of decals were changed, but apart from that they are identical. To be honest, the Gama/Matsushiro release is the only example of this toy I’ve ever actually come across, so it may be that hardly any examples were sold outside of the Gama distribution. The box has Gama’s “Gama Tronic” logo on it (this was just a sub-branding for any R/C models they sold) and lots of German writing that I can’t fully understand. But the general feeling is of a realistic “6 function model” with lots of features for the time – and even a little driver. I’ve never been one of those crazy collectors obsessed with “mint boxes”, though I always look for mint condition in terms of the toys themselves. But I don’t mind a bit of patina on boxes. It just makes them feel all the more vintage. I particularly love seeing old price stickers too, as this really confirms that something came from a lost era. This example carries a German price sticker for a shop called “Florence Görg” (?) on the box front, and a price of “149.95” – which would have been Deutsche Mark back in those days. Which seems like quite a lot. And even the Japanese price seen on the first image above says “8,800” (yen). So it’s safe to say this was a fairly premium toy back in the day, despite it’s size. Somewhere in the $50-$100 range anyway. Which kind of goes against what I was saying earlier about the “smaller and more affordable first R/C cars we owned”. But all R/C cars in the 80s were a lot more expensive (even the smallest ones) than the Chinese fodder you find in toy shops today. Considering it’s 1/20 scale and only 21cm in length, Matsushiro packed pretty much everything they could into this little Land Cruiser model, for the time. 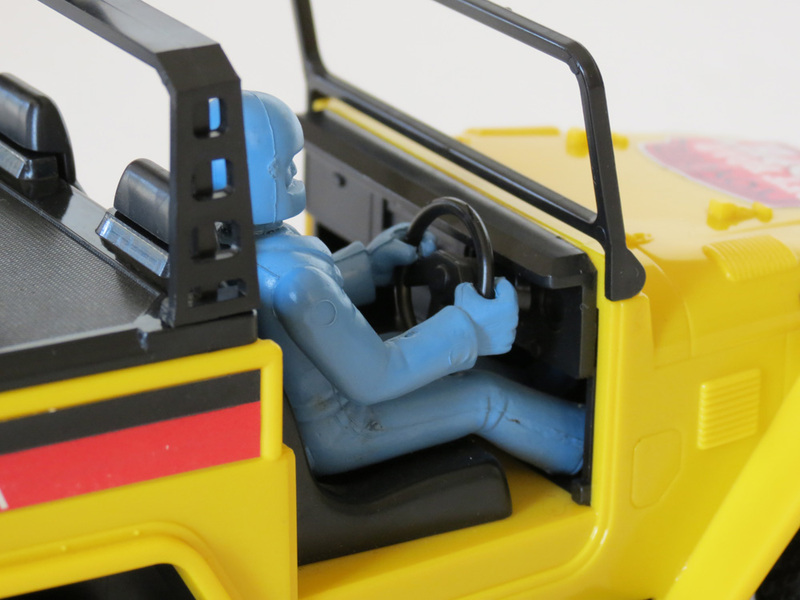 First, to the driver – that little blue figure is made from a rubber or vinyl material, making him very flexible, and he has been attached into his seat as a separate piece (he almost seems like he might be removeable – but I don’t want to force it). He grips the steering wheel, and when you drive the model the steering wheel actually turns as well…so the arms of the driver create the illusion that he’s the one doing the steering. It’s simple, but quite effective – and I’m surprised more R/C toy makers didn’t employ this little trick in other cars. I always find yellow cars eye-catching, and the blue driver contrasts well with the bright yellow of this toy. The car itself is of course another 40 series Land Cruiser, the type revered among off-road enthusiasts as one of the most rugged 4WD vehicles ever manufactured, by arguably the most reliable car maker in history. Notice that the decal on the bonnet says “Toyota Off Road Trophy“. Back in the 1980s, there was a moderately famous off-road event called the Camel Trophy, in which 4WD vehicles would journey through some of the world’s most rugged terrain, purely to prove it could be done. Unfortunately the event was organized by Land Rover and restricted only to Land Rovers. So cars like the 40 series Toyota Land Cruiser were never allowed to compete. The title sponsor, Camel, was a cigarette brand known for bright yellow brand colouring and an interest in motorsport – leading to them sponsor a number of yellow Formula One and Paris-Dakar cars over the years. Many (perhaps all?) of the cars that actually took part in the Camel Trophy were also therefore painted yellow, with the event “trophy” logo on them. Just like this Land Cruiser. As much as I admire old Land Rovers, I’ll always be a Land Cruiser fan first and foremost. And while this is a tiny Land Cruiser compared to some others that were around in the early 1980s, I do still love the look of it. When it comes to driving, it goes well and is also pretty quiet. It’s not what you’d call fast, but what would you expect? It’s not really designed for off roading, with hard (though realistic) rubber tyres and no suspension. Although it does come with a rocking rear axle mechanism, to allow the car’s camber to follow the terrain. So they did think about how it would climb over small obstacles. This was mostly a toy for smooth surfaces, and only very light (if any) off road duty though. Though if I’d had it when I was a boy, I’d have probably tried to take it just about everywhere (! ), including over mountains and through puddles – just based on it’s looks alone. Kids can’t help but play with cars in the dirt. 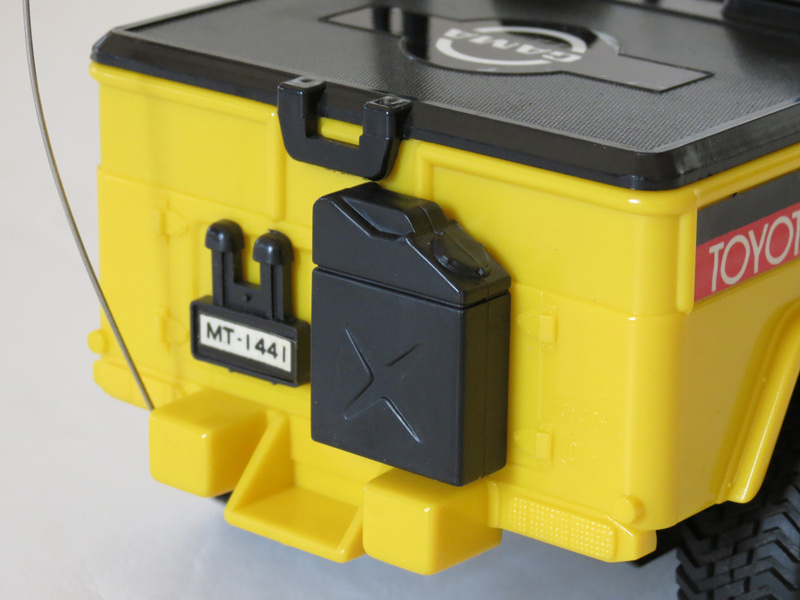 The Matsushiro radio equipment was always quite good quality and there are very few “stutters” and “glitches” when operating, and it glides around pretty smoothly, powered by it’s 6 x AA batteries loaded into that bulky rear boot area. There’s a bit of understeer, due to the fact it’s rear wheel drive yet there’s no differential. It is Digital Proportional though, which offers gradual speed and steering adjustment. And that alone makes the car seem all the more realistic and “scale-like” as it moves. It’s pretty unusual to find Digital Proportional on a toy car this diminutive, as it was normally a feature of larger R/C models. The roof bar with the light on it is actually a separate piece that comes in the box and must be clipped into place. And I’m not even sure why it’s there really, as I’ve never seen an open-roof Land Cruiser like this, with a roof bar with a single light in the middle. But hey! I always tend to think that any piece you clip on or clip off a car is for fun, and just adds to the play value. Inevitably though, loose pieces means lost pieces… and that roof bar is one of the first things that went missing on this model when it was played with (most examples you will ever see are missing the roof bar). Another nice touch is that the front headlights work and are actually switched-on via a switch underneath the car, and then illuminate as the car moves. Lastly, there are also 2 speeds (Low/High) – selectable via another switch under the car. The on-off switch is smartly located in the centre console of the driver’s area, along with a recharge jack. A jerry can at the back and a foldable front windscreen (with no glass) caps off the scale detail of this little car. 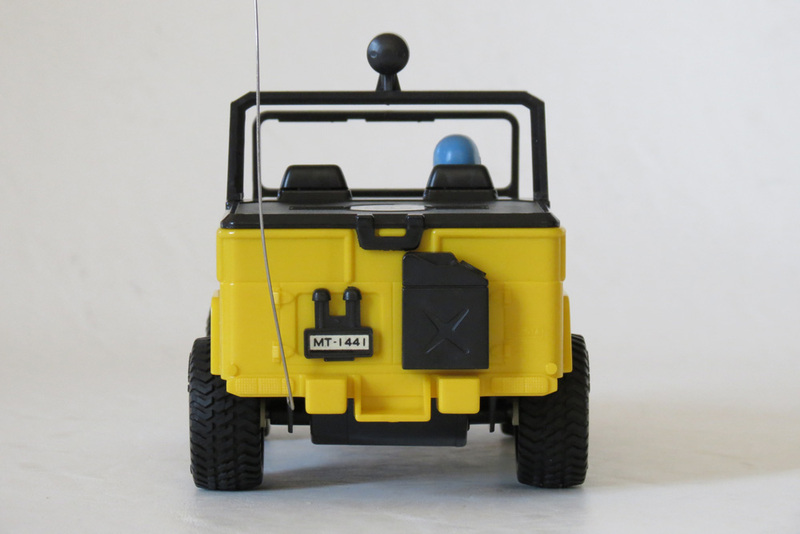 To sum up, the Gama/Matsushiro Toyota Land Cruiser is a really cute little R/C model that I know collectors of Land Cruiser memorabilia will definitely want to track down. Coincidentally I even had someone write me to ask about it only a couple of days before writing this article, and I suspect that the majority of those who owned this toy were residents of Europe (particularly Germany). 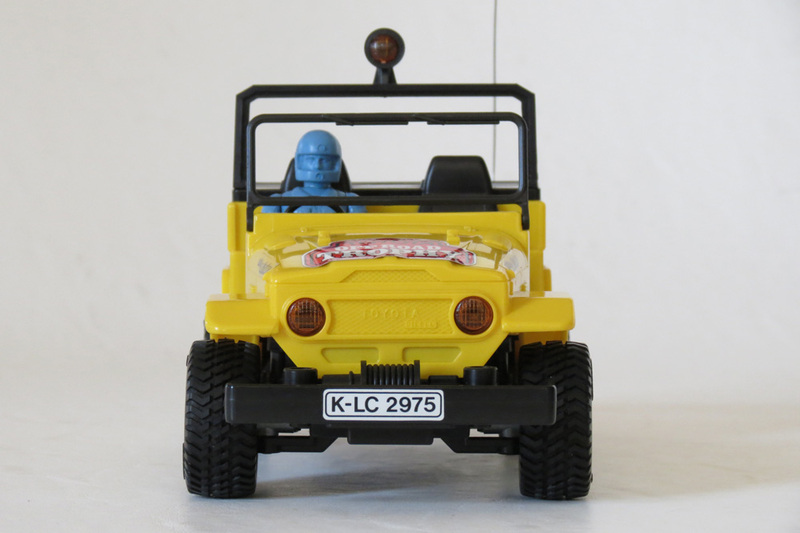 As mentioned, it was never so much a toy for off-road, as a cute little R/C Land Cruiser with working headlights (and an animated driver) for relatively smooth surfaces. The Winch was the more robust Matsushiro model for the backyard. 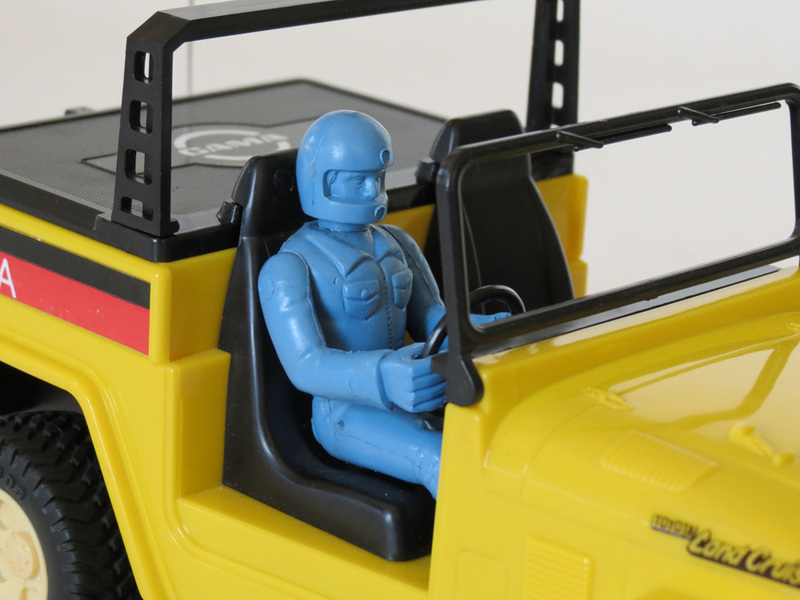 But if you love Land Cruiser toys, or any realistic R/C toys from the early 1980s (pre-buggy) era, this one definitely deserves a place on your shelf as well. The Gama/Matsushiro Toyota Land Cruiser is rare and has a few fragile parts, leaving most examples incomplete. Here are the main things to look out for when collecting this model.